Since I was running out of my Coffee Scrub from The Nature’s Co, and no possibilities of going to Phoenix Mall in the near future, I decided order it and try out another product online. I’ve already reviewed the Coffee Scrub here. 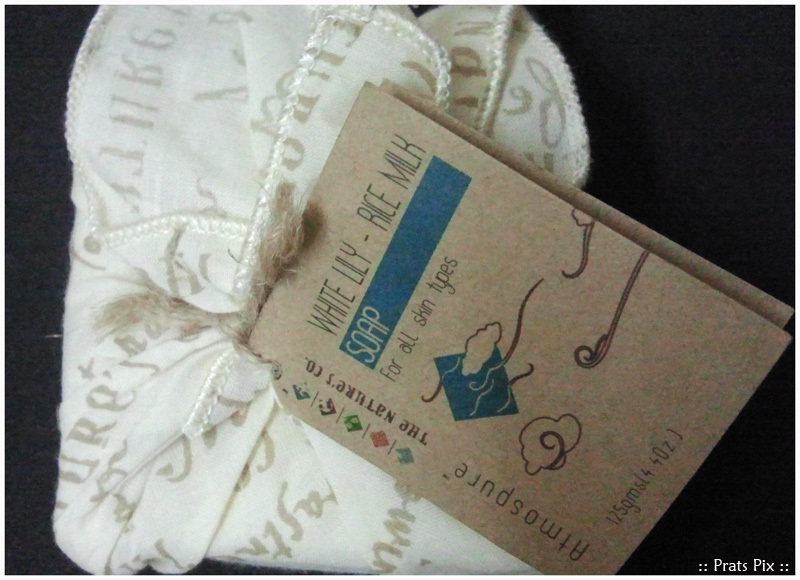 Now, the second product that I bought online was the White Lily – Rice Milk soap for all skin types from their Atmospure Range. Before I go on with the review, one note here. I am not sure if anyone else faced the same issue, but I had to pay an Octroi of an additional amount of INR 78 to the courier company that got my product. This amount was over and above what I had already paid to the company for shopping online. This is quite strange, because I do most of my shopping online from a few well known sites, and I’ve never been charged an octroi for getting a package delivered. What is more strange is the fact is the The Nature’s Co. had sent products to be reviewed in Dec, which I have posted here, and I did not pay the octroi even at that point of time. Anyway, not to digress, but here is my review. I quite like the packaging of the product. It comes wrapped up in a square cloth tied with a thin rope. The soap is from their Atmospure range. Priced at INR 275 for a 125 gm bar, its a tad expensive. Since I like to try out various soaps, and I had not tried from The Natures Co, I bought this one. It smells heavenly. Its a white milky bar that makes me feel like I am holding a chunk of white chocolate! The smell lingers on for quite a while after a bath. I quite like this soap and much as I am tempted to buy one more of this, I would probably go to their store one of these days to try more products that I could review. On the first day, I used just the soap, but on the second day I used the Sandalwood and Cinnamon Bath oil to seal in the moisture in the body. Why did I do this? Simple, its winter and just a soap was making my skin feel stretched and itchy. A note here that people with oily skin may not feel the same way as I did because of the skin type difference. The small tag with the soap says that the key ingredients in the soap are: Olive Oil, Rice Milk, Vegetable Oil and White Lily Oil. It also mentions that the product has been made using Natural Hill spring water. So , yes, the product is natural without any chemicals and should not harm your skin in any way. Soothe and calm dry, sensitive or irritated skin with the healing properties of White Lily – Rice Milk Soap. With ingredients like Rice Milk and vegetable oil, it helps moisturize, heal and nourish.